Welcome to Doc Alexander. This blog is dedicated to my grandfather, Dr. Laurence Guy Alexander. He was a prominent Calgary doctor who enlisted with the 14th Army Tank Battalion, Calgary Regiment, but better known as the Calgary Tanks as the regiment’s medical officer on March 1, 1941 at the age of 42. As a veteran of the First World war – he had served as a stretcher bearer and in a mortar unit – he knew his training as a surgeon and family doctor were essential to the war effort. But in doing so, he left behind his wife, Muriel, and his four children, Jack, Jill, Don and Bob. Officially, he was a member of the Royal Canadian Army Medical Corps and his hat badge on his black beret worn by members of Canada’s tank regiments was that of the RCAMC, but his heart belonged to the Calgary Tanks. He is often remembered as a kind, generous, caring man who didn’t take himself or the army seriously. He did, however, take his job seriously and the men of the Calgary Regiment were his first priority, which is why the soldiers of the Calgary Regiment still refer to him simply as ‘Doc Alexander’. This blog tracks Doc Alexander’s experience in the Second World War from March 1, 1941 through to his last entry on September 13, 1945. During those two bookends, he experienced the Dieppe Raid, Operation Jubilee, on August 19, 1942 (he was one of the few officers of the Calgary Regiment to return from the raid) and the invasion of Sicily and Italy. 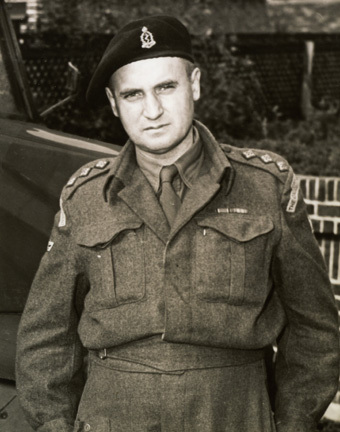 He would later serve on the front lines during the liberation of Belgium and Holland after given command of the 6th Canadian Field Dressing Station. He was wounded at least three times during the war, twice at Dieppe, where he earned the Military Cross and was inducted into the British Empire as a Member. I plan to post a new journal entry on the day Doc Alexander wrote them. Many of the posts, such as the first ones from March through May are mundane, while others such as the lengthy journal entry detailing the Dieppe Raid from his perspective are remarkable. But all told, the journals provide an exceptional window into one man’s experience – and one who was not a combatant, but who saw the worst war could deliver – throughout the course of the war. I have posted the first year – March 1, 1941 to March 3, 1942 – to get caught up to 2012 so that from here on, each journal entry is exactly 70 years after Doc Alexander wrote them. Hi Gordon. Thank you. Your father and my grandfather have much in common when you factor in shared experience. I had a look at your blog and it’s great to get the naval experience. It’s one that is often overlooked, despite the fact that it was a difficult and dangerous job. This is a beautifully presented and interesting blog. I found it quite by accident, while trying to find out about the history of a building in Seaford. My late neighbour lived in Seaford throughout her life, including the war years. Like most natives of the town, she had respect and admiration for the Canadians who were here during those years.